The worsening budget outlook means that meeting certain fiscal goals is now much more difficult than it was previously. 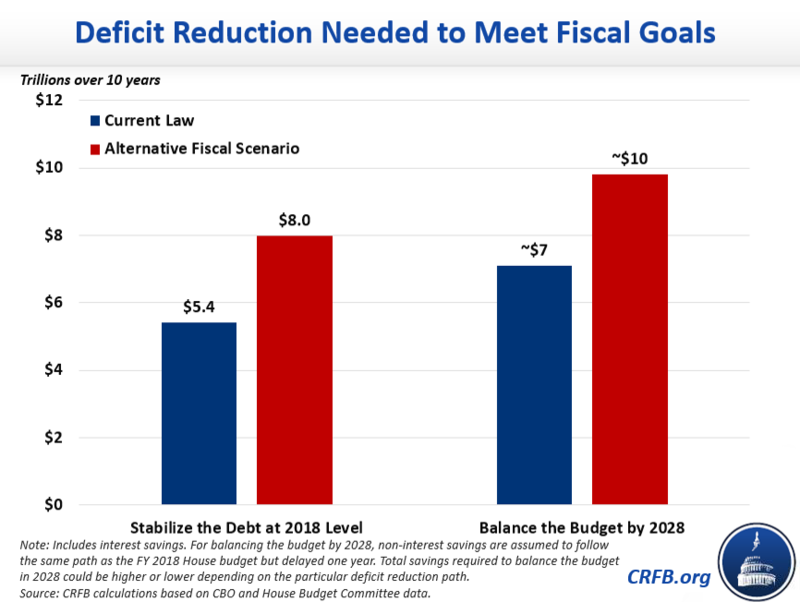 We estimate that balancing the budget in ten years would require savings of between $7 trillion and $10 trillion, while just stabilizing the debt at its already high level would require $5.4 trillion to $8 trillion. Last year the Fiscal Year (FY) 2018 House budget was able to balance after ten years by claiming about $6.5 trillion of total savings. Even ignoring the fact that just under half of those savings reflect gimmicks or optimistic assumptions, the same amount of deficit reduction would not be enough to achieve the same goal under the Congressional Budget Office's (CBO's) latest budget outlook, especially if policymakers choose to continue recent tax cuts and spending increases. Assuming a similar non-interest savings path as the House budget, lawmakers would now have to find approximately $7 trillion of total savings over ten years to balance the budget in 2028 against CBO’s new current law baseline, or $10 trillion compared to its Alternative Fiscal Scenario (AFS) that assumes many current policies are extended. Even meeting a less ambitious goal would still require major policy changes. Stabilizing debt at its 2018 level of 78 percent of Gross Domestic Product (GDP) by 2028 would take approximately $5.4 trillion in savings compared to current law or $8 trillion compared to the AFS. Hitting either of these fiscal targets would require ambitious revenue increases or spending reductions. For context, most recent Congressional budgets have claimed around $6 trillion in deficit reduction (often relying on gimmicks and overly optimistic assumptions), and none have included reconciliation instructions requiring specific deficit reduction of such magnitude. Fiscal goals are a crucial part of budgeting, but they are no substitute for the tough policy choices needed to reduce the debt. With trillion-dollar deficits returning in just two years and debt held by the public quickly approaching the size of the entire economy, it is more important than ever for policymakers to not only set a meaningful fiscal goal but to enact the necessary tax and spending changes needed to meet it.